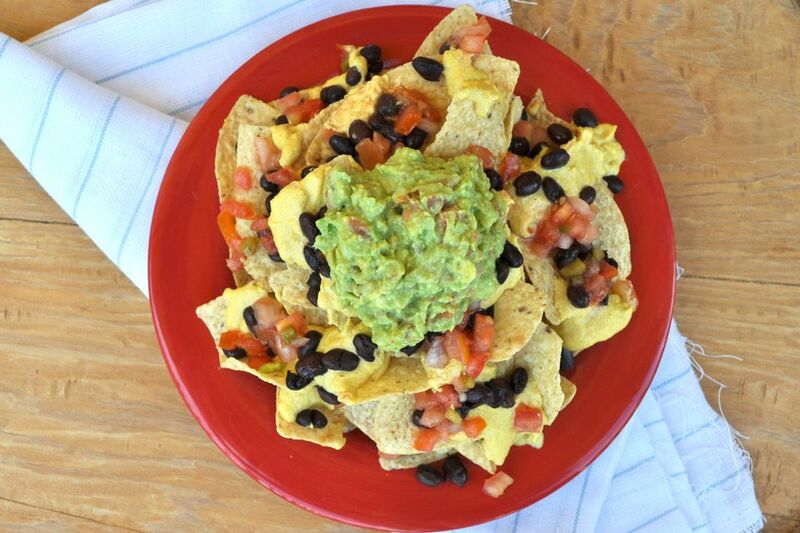 Who says you need meat and cheese to have over-the-top, mouth-watering nachos? Topped with beans, salsa, guacamole, and an easy homemade vegan cheese sauce, these nachos will disappear in a flash. Use store-bought salsa and guacamole, or make your own: try our Fresh Tomato Salsa and our All-Purpose Guacamole. The vegan cheese sauce comes together in no time, but you will need to think ahead a bit to soak the cashews. You'll also need a blender. If you have a fancy, Vitamix-style blender with a lot of power, you can get away with only soaking the cashews for about half an hour. For a regular blender, soak the nuts for at least an hour. Either way, make sure you blend up the sauce until it is super smooth. This recipe calls for nutritional yeast, a healthy ingredient that adds a nice cheesy flavor. You can find it in health food stores or sometimes the bulk aisle. Place the cashews in a bowl and cover with room temperature water. Let soak for at least 30 minutes or up to 3 hours. Drain. Preheat a skillet over medium heat. Once hot, add the oil followed by the onion. Cook for a few minutes, stirring occasionally, and add the garlic. Cook for 2-3 more minutes, or until the onion is translucent. Add the paprika, chili powder, turmeric, and garlic powder. Stir and remove from the heat. Add the drained cashews, onion mixture, almond milk, nutritional yeast, lemon juice, and mustard to a blender. Season with salt and pepper and secure the lid. Blend until very smooth, adding water 1/4 cup at a time until desired consistency is reached. Taste for seasoning and adjust as needed. Add the blended sauce to a saucepot and warm over low heat, stirring constantly. Add a splash or two of water if it thickens up too much. On a platter or individual plates, pile up half of the chips and top with cheese sauce, beans, and salsa. Top with the other half of the chips and repeat, ending with a mound of guacamole. Serve immediately.